‘If a Tangent Universe occurs, it will be highly unstable, sustaining life for no longer than several weeks. Eventually it will collapse upon itself, forming a black hole within the Primary Universe capable of destroying all existence.’ – from The Philosophy of Time Travel by Roberta Sparrow (as seen on screen in Donnie Darko: The Director’s Cut, 2004). 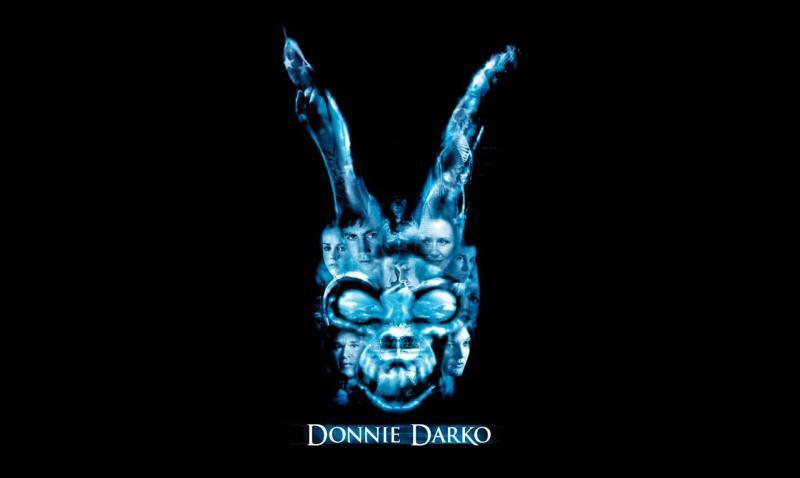 As the debut feature by director Richard Kelly, Donnie Darko is a stunning statement of intent, depicting the last day(s) of the eponymous troubled teenager who, having narrowly escaped death by UFO (a mysterious, unclaimed jet engine that falls through his bedroom ceiling) due to his somnambulism, spends the next month being visited by an animal totem warning him about the approaching end of the world. Kelly effortlessly mixes a perfect recreation of the 1980s, through subtle direction of his young cast as well as extended cameos by notable children of the 80s – Drew Barrymore and Patrick Swayze – the well-chosen backdrop of a presidential election (many jokes in the film derive from Michael Dukakis’s claim on office) and a terrific soundtrack including well-known and lesser-known tracks from the period. Indeed, the latter aspect of the film drew comparisons with the work of Quentin Tarantino, another director renowned for creating atmosphere in his films through a well-curated soundtrack, and Kelly’s debut came second in Empire magazine’s list of ‘Greatest Independent Films’ after Tarantino’s Reservoir Dogs (1992). In the original cinema release of Donnie Darko, Kelly expertly combines the eschatological and SF aspects of the script with the depiction of teenage angst and ennui. Donnie’s psychological problems are contrasted with his visions of humanoid demon rabbit Frank, Frank’s ability to conjure wormholes and forcefields, and the billowing iridescent snakes that Darko sees issuing from people’s chests, which display their future paths through life. Almost every aspect of the film is spot on, from the terrific casting of Jake Gyllenhaal as the lead, his real-life sister Maggie as his fictional sister on screen (a sibling double act to rival John and Joan Cusack), to the subtle humour in the dialogue and in visual gags, such as the local cinema’s advertising of an irresistible Halloween double bill: The Last Temptation of Christ (1988) and The Evil Dead (1981) – two films about resurrection whose leads are also harassed by supernatural forces. It’s been said that director Orson Welles lived his career in reverse, starting with the finest film that he (and arguable anyone else) ever directed, followed by a downward slide. Unfortunately, in his first three films as director, Kelly has followed a similar path; Darko is excellent but Southland Tales (2007) is absolute drivel and The Box (2009) is a wasted opportunity. Without grilling the director and his collaborators, it’s hard to work out what went wrong. It’s possible that Kelly only had one really good film in him, or made a good film despite himself – as evidenced by the considerably less successful director’s cut of Darko, which bloats the running time by 20 minutes, including scenes that don’t work as well as the original footage (such as an awkward and ill-judged discussion of divorce by his parents) and unnecessary shots of information being both downloaded into Donnie’s brain and superimposed on screen. If you listen to the director’s commentary on the movie (in conversation with Kevin Smith), it becomes increasingly apparent that Kelly always intended to make a less ambiguous film than the one originally released. There’s a lot to be said about the modern phenomenon of the director’s cut – certainly the most famous example, Ridley Scott’s Blade Runner (1982/1992), does improve on the cinema release (although 2007’s ‘final cut’ doesn’t) – but just because a director can do a more idiosyncratic cut of a previously released film, it doesn’t necessarily mean he or she should. Unlike Blade Runner, the director’s cut of Donnie Darko thankfully hasn’t superseded the original, otherwise the film’s reputation might be gradually tarnished, but the director has gone on to make underwhelming films that may yet damage his own reputation. First to follow Donnie Darko is the grande folie Southland Tales, a 144-minute sci-fi comedy that fails to tell a coherent narrative in its interminable running time. Following a disastrous screening at Cannes of an even longer cut (I’ve had the misfortune of seeing both), it led to Kelly writing three prequel comic books to start off the story. For better or worse, George Lucas inspired a generation of filmmakers, and like his most famous film, Southland Tales begins with ‘Episode 4’, a device that may have added to the allure of Star Wars (1977) when it was re-released, but does nothing for Kelly’s confused epic. Tales is a multi-voiced narrative set in the south of the United States after a nuclear explosion has irradiated Texas and accelerated the advent of a police state and the need for new forms of electrical production. Unlike Donnie Darko‘s sideways travels in time, which make sense at least within the film’s internal narrative (even if it’s not clear what Frank’s predicted apocalypse will entail), Southland Tales sees two characters travel back in time. Unlike Donnie Darko, actor Boxer Santaros (Dwayne Johnson) and police office Roland Taverner (Seann William Scott) have ended up as their own doppelgängers (something that would reoccur in the sequel to Donnie Darko, S. Darko, in 2009), co-existing with them. In Boxer’s case, his copy has died, but as two Taverners still co-exist, their eventually meeting – in a plot device seen in many other time travel movies, where there are dire warnings about confronting oneself – presages the apocalypse. I haven’t seen Steven Spielberg’s 1941 (1979), but the mixed (and generally unfavourable) reactions to that film suggest that Southland Tales is a similar experience, not only as a broad, ill-conceived comedy postulated as a response to a semi-apocalyptic event inflicted on the American people (Pearl Harbor, belatedly, in Spielberg’s case / September 11, 2001, in Kelly’s), but also as the product of an imaginative low-budget director being given more money than he knows how to spend, with access to a comedic cast he doesn’t know how to direct. Although Spielberg’s subsequent films have included comedic elements – witty dialogue in the Indiana Jones films, for example – he hasn’t done another full-blown comedy again, and on the basis of this, it is to be hoped that neither will Kelly. I’m not going to explore Kelly’s script (about the real-life bounty hunter) Domino (2005), directed by Tony Scott, as there’s nothing about the movie that deals with the fall of mankind, other than Scott’s attention-deficit-disorder style of shooting and editing, but Kelly’s third film, The Box, is a partial return to form and a thematic prequel to Donnie Darko in many ways. Like Darko, The Box effectively mixes a well-conceived recreation of a recent historic era – in this case the mid-1970s – with mysterious presages of doom (here, facially scarred Frank Langella and his acolytes, replacing his namesake in Darko as the disrupter of a suburban household) and autobiographical elements. I don’t know if the high school scenes in Darko are based on Kelly’s own experiences – there is an honesty and reality to them that suggest they are – but certainly the lives of Arthur and Norma Lewis in The Box, as played by James Marsden and Gwyneth Paltrow, are based on Kelly’s own parents, including the former’s role at NASA and the latter’s pedal deformity and job as a high school teacher. However, while Darko told a relatively straightforward narrative in a beguiling way, Kelly’s adaptation of the short story ‘Button, Button’ by Richard Matheson (previously filmed as an episode of The Twilight Zone in 1986 by Peter Medak) sees the director distracted by too many narrative possibilities, left potentially unexplored by the original short story and TV adaptation. While his overegging of the script in The Box doesn’t cause this eschatological soufflé to completely collapse – as Southland Tales does – it is too complicated for its own good and makes the casual viewer wonder why the director felt the need to over-embellish a memorable story that succeeded due to its simplicity. The Box is set in Langley, Virginia, in 1976, an evocative time and place due to the celebrations of America’s bicentennial and the first contact of mankind (or at least its robots) with the Martian landscape, bringing with it the potential discovery of life on another planet. The juxtaposition between these events, the arrival of a mysterious man, who offers ordinary couples the chance to earn a million dollars through the pressing of a button in a box, and the subsequent execution of a random stranger, is never fully articulated. The non-terrestrial origins of Langella and his network of remote viewers are never explained either. But the co-opting of some of the style and imagery of Stanley Kubrick’s 2001: A Space Odyssey (1968) suggests that mankind’s first landfall on another world (as with the unearthing of the Black Monolith on the Moon in 2001) has initiated a test by a greater intelligence to see if we need guidance from now on. Certainly the aims of Frank Langella’s character are described as a test of our morality, to see if we are worthy of continued existence as a race. Like Darko, The Box contains a text that ‘explains’ (or rather obfuscates) the nature of travel between different realities: ‘Grandma Death’ / Roberta Sparrow’s The Philosophy of Time Travel in Darko and Human Resource Exploitation Manual, Section 1 – Abstracts (July 1976) in The Box. Both feature exactly the same drawing (which must indicate more than just laziness on the director’s behalf) of a human skeleton moving through dimensions and both contain mention of some kind of watery portal between these places. In an extract from The Philosophy of Time Travel seen on screen in Donnie Darko: The Director’s Cut, we read: ‘Water is the barrier element for the construction of Time Portals used as gateways between Universes’, which is applicable to the ‘science’ we see in both movies and suggests both books are possibly one and the same. In Darko, when a character asks about how time travel can be philosophical, this is entirely apposite as it’s as much about Donnie’s experience and interpretation of the world – indeed the entire movie could be the hallucinations of a disturbed mind (possibly during his last hour of life). This is crystallised in a conversation that the character has with his science teacher; when Donnie asks about how God might influence time travel, his lecturer ends the conversation as it is beyond his remit as both a scientist and a state-employed teacher to answer that kind of question. However, although The Box has an atmosphere of hard science – the male lead character works for NASA, after all – the brief glimpse we have of the book doesn’t even contain good science, including such extracts as: ‘Test subject is submerged in NaOH+Hcl barrier during analysis period of 60 minutes.’ Curious about the chemistry, I googled it and ‘NaOH+Hcl’ is meaningless in this context – it describes the production of water in an acidic chemical reaction. The correct formula is something along the lines of ‘H2O+[C10F18+O2]’, which describes the properties of an oxygen-rich liquid that human beings can be submerged in for long periods of time, as proposed for future space exploration (which is mentioned elsewhere in the film) and shown in other SF films such as James Cameron’s The Abyss (1989), a film that clearly influenced Kelly in its (CGI) depiction of water-based life forms. The problem is that Kelly wants to have his cake and eat it – he proposes pseudo-science that sounds plausible, but the more you give the audience a chance to examine it, the greater the chance they might realise how daft it is. To try and deflect this realisation, in The Box, Kelly has Marsden quote writer Arthur C. Clarke: ‘Any sufficiently advanced technology is indistinguishable from magic’ while staring at a religious canvas in the Renaissance style, suggesting that simultaneously he wants to try and understand the science, dismiss the science as too hard to understand, and attribute a supernatural/religious aspect to it. Continuing the theme of art and religion, in a deleted scene on the Blu-ray we see a triptych of deformed self-portraits by Francis Bacon on a desk in Frank Langella’s ‘Bond villain’ lair – inviting questions about whether an alien possessing the body of a man with a horrifically scarred face is looking for a reflection of himself, or whether his scarification was intended to evoke a literal example of humanity’s self-loathing. In an additional line of voice-over added to the director’s cut of Donnie Darko, Frank says, ‘pay close attention, you could miss something’. But with Kelly’s scattergun approach to imagery and ideas in all his films except the original cinematic release of Darko, there are so many elements, clues and red herrings, that without clearer storytelling, the audience is more likely to be perplexed than enraptured. Within The Box and its excised footage, there’s the potential for a better film – trying to come up with a coherent edit of Southland Tales would defeat even an expert editor – and a double bill of Kelly’s first and third films makes for arresting viewing. However, the question of what it all means is left unresolved – the workmanlike remake/sequel S.Darko does the original no favours – so unless the director’s next or subsequent project forms a more satisfying trilogy with Donnie Darko and The Box, it is a picture of the apocalypse left unresolved, an ‘apocatastasis’ where one has a vision of the end times but the revelation is interrupted and remains incoherent. Whether the director can show us the end of the world in a way that satisfies the audience is yet to be seen. I wonder if anything interesting happened in his family history in the 1990s that may yield another good film in the future. As undeniably messy and misjudged as Southland Tales is, I can’t help but love it despite, or perhaps because of, its flaws. There’s just something about it, that something so bloated and stupid ever got made, that just makes me giggle whenever I watch it (and yes, I’ve watched it several times). A guilty pleasure if there ever was one. The Box was successful in creating a period mood and atmosphere of paranoia (yes, the whole “they’re all out to get you” approach has been done to death, but it was more skillfully handled than most), but I agree it overcomplicates the mystery. Still haven’t seen the director’s cut of Donnie Darko, because dispersing the ambiguity that made the film so interesting is not something I’m interested in. I loved Darko. I didn’t like Southland Tales… Too many uninteresting characters in a very complex story. I liked “The Box”, but I would suggest (as same as Darko) to watch it more than once. The questions with no answer that “The Box” generate are no different (generally speaking) as the ones in Darko. By the way, the actor in “The Box” is not Gwyneth Paltrow, it’s Cameron Diaz.